Palm Coast Fl Auto Repair | JAMHS Auto Inc. - JAMHS AUTO google38b2e1bd6f2ba1c8.html google-site-verification: google38b2e1bd6f2ba1c8.html How you can prevent high cost repairs: Regular Maintenance. I am a family man; Tacha & I have been married 20 years. We have three sons and train them to be honest, respectful to others, and to work to earn their wealth by our example. 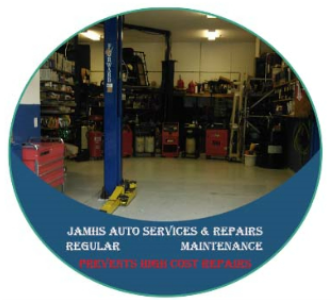 JAMHS Auto established in 1996. With more than 20 yrs. of experience, JAMHS Auto has been offering general auto repair and vehicle maintenance to its clients; and in Palm Coast, Florida for more than 10 years. JAMHS Auto meets Better Business Bureau (BBB) Accreditation Standards, which include a commitment to make a good faith effort to resolve any customer complaints. In addition, JAMHS Auto has Technician certified by the National Institute for Automotive Service Excellence (ASE).